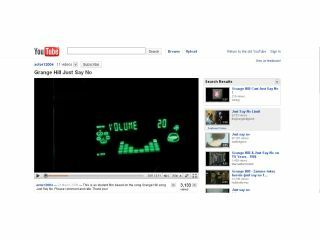 YouTube has announced it has redesigned its video page to be easier on the eye and quicker to use. The main problem with YouTube's interface is that it sometimes feels cluttered. Google knows this and that is why it has thought 'new year, new look'. "We're excited to unveil the first major example of our efforts to simplify and streamline the video page to offer the best possible watching experience," said YouTube in a blog. "To check out this new look all you have to do is opt-in. To revert back to the old video page, use the opt-out link at the top of the new video page. "We'll be making the opt-in more easily accessible soon, but we wanted to give our most passionate users a chance to experiment with it early." Streamlined look and functionality YouTube has decided to make video the star by making the page look "more subdued, stripped down and simple" – perfect for viewing The Greatest Freakout Ever. Cleaned up actions bar Actions have now been grouped, so there's not much on show to avert your eye when watching a cat stuck in a laundry basket. Simplified binary ratings Instead of rating videos out of five you can now simply Like or Don't like a video. Great then for rating the Grange Hill 'Just Say No' song as a Like! Search results within the page The search bar of YouTube is now on every page, so there's no need to flit back and fourth. The best thing is the search results will come up and the video will keep playing is small form. Superb then for searching for 'comedy fall' and finding a genius video of bicycle japes. To see the new features in action, point your browser to http://youtubeukblog.blogspot.com. Or, watch the video below which is kitted out with all the new features.